Magento is an excellent platform that is favored by the modern entrepreneurs in today’s digital market. The high-quality images, secure payment gateways, flexible and customizable open-source platform, SEO-friendly and fast integration with the current applications make it a great platform to work on. The cool features provided by the Magento development company which enhance the e-commerce experience of the users are as follows. Magento has reduced the cart abandonment rate to a good extent by cutting the steps in the checkout process and making it more simple. The facility is now provided to the shoppers to do the shopping as guests rather than registering themselves on the store. Also, the product images can also be seen in the order summary so that the customers can verify their order properly. The billing and the shipping details are presented in a simple manner too by the Magento development services. The catalog is the key component for the online shopping on the e-stores where the beauty products, clothing, electronic items or any other products are being sold. The Magento development services offer extensive catalog management features which include the support for virtual products, allows downloading for music, videos, and other digital products. One can edit and delete product reviews effortlessly and other customization options such as resizing and watermarking are also available. One of the coolest Magento features is the mobile-friendly commerce where the provision for browsing the full site store is available on the mobile as well. The Mobile HTML5 technology is used to create the mobile-friendly stores and these stores are compatible with both the Android and iPhone platforms. All different types of browsers are supported by this feature and the online shopping can be done through any kind of mobile device. The drag and drop, swipe, zoom and multi-touch features are provided smoothly. Another cool feature provided by the Magento development team is the option of sharing an email with our friends. The products and brands can be referred to our friends by sharing an email with them so that they can buy those products for themselves. This helps in building a good reputation for the brand. The customers who share such referral emails can be given good discount offers and free shipping offers. The Magento development offers excellent order management system. The users can view, create, edit and fulfill orders directly from the admin panel available on the front menu. It allows creating more than one invoice, credit memos, and shipments in the single orders as well. Email notifications for the order are received very fast and RSS feed is generated also quickly for fresh orders. It also helps in packing slips, shipping labels and also in printing invoices. The Magento company gives a great importance to the SEO for the websites and so provides great features to help us make the search engine optimization smooth for our store and website. It generates Google Sitemaps, supports URLs which are search engine friendly, it automatically sorts popular searches, provides faster loading options for the images and provides the right guidance to achieve the best possible optimization of the page. It also suggests the right keywords that should be included in the articles to get a better ranking in the web searches. The customer wish-list is another cool feature that helps in growing the business faster. Through this, the customers can save certain products in their wish lists which they want to buy later. The information gained from the wish list helps the seller to provide personalized offers to the customers. The Magento development team has provided the facility to the customers to post the reviews of the products and this works as a wonderful marketing strategy which helps in increasing the sales of the products through positive reviews posted by the users. The user account is made very simple and convenient for the users to handle it with ease. The user dashboard is made in a simple and decent manner. The recent orders, history, and status are shown and the wish list of the users can also be stored. Different home addresses can also be stored for the users having multiple home addresses. The facility is provided to the users to re-order the previous orders from the account itself. The Magento development team has enabled the platform to include great back-end tools for customer support. The Contact Us form helps the users to contact the authorities for any help needed. As a part of the customer service, the complaints of the customers should be viewed by the site owners and necessary steps should be taken to solve them as soon as possible. Order tracking is done live to the users with the constant email updates. The support for local, international currencies and the tax rates is provided. There are numerous features provided for tracking, analyzing and reporting by the Magento company for your own business. The analytics play a huge role in proliferating the growth of the business, through it we are able to decide what are the requirements of the users in the current market and what are their likes and dislikes. Google Analytics, sales and tax reports, product review report, shopping cart abandonment report and many other features are provided by the Magento development company. 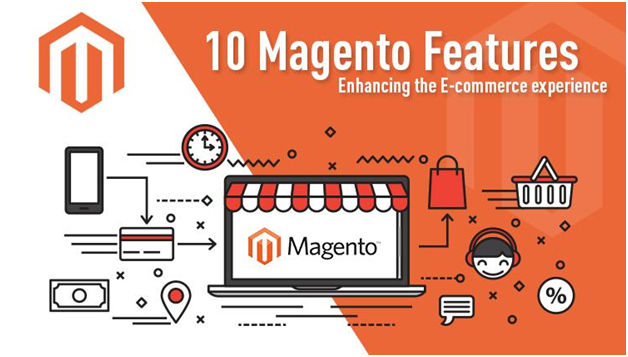 Thus, these were the 10 features that enhance the Magento e-commerce experience. Make sure you use them to proliferate your business. Harshal Shah has a countless experience as being a CEO of Elsner Technologies PVT. LTD: Magento Development Company that offers various web development services to the clients across the globe. Mr. Harshal is a huge tech enthusiastic person who has written major & genuine articles as well as blogs on motley topics relevant to various CMS platforms. This can guide the readers to acknowledge new practices about web development and also they can learn new ideas to build & optimize a website online using multiple web development tools & techniques.